Atlas stationary concrete batch mix plants are built on a rugged structure. These stationary concrete batch plants are for those who want to make high concrete production without frequently moving from place to place. Concrete batching plants come with maintenance free twin shaft mixer for homogenous mixing of ready mix concrete in a short time. Stationary concrete mixing plants can be offered with cement and fly ash silos for feeding of the same. Aggregate weighing is done in the conveyor just below the feeder bins. There is a separate conveyor which takes the material after weighing into the mixing unit of the stationary concrete batching plant. There is weighing provision for cement, flyash, ater and additives in the stationary concrete plants for sale by Atlas. The PLC control panel is very easy to use and offers easy control of all parameters for the concrete mixer. ASCB 30 - 30 m3/hr. ASCB 45 - 45 m3/hr. ASCB 60 - 60 m3/hr. ASCB 75 - 75 m3/hr. ASCB 90 - 90 m3/hr. ASCB 120 - 120 m3/hr. ASCB 150 - 150 m3/hr. ASCB 200 - 200 m3/hr. We hold expertise in offering an exclusive array of Stationary Concrete Batch Mix Plant which is design for built for tough Indian operating conditions, our offered batch mix plant is provided in various specifications to meet the diverse needs of the clients. This batch mix plant is designed with best quality of material & leading techniques. 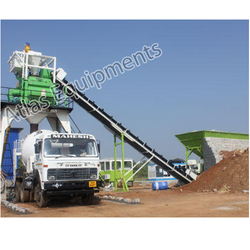 Looking for Stationary concrete batch mix plant ?